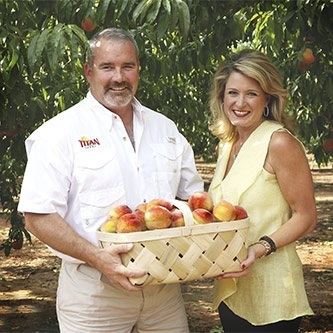 Titan Farms is the largest peach grower on the east coast, with over 6,200 acres of peaches in production. We also grow 600 acres of bell pepper and 1,000 acres of broccoli in the operation. Titan Farms is committed to assuring customers that their peaches and other produce have been grown and handled according to the highest possible standards in the marketplace. Titan Farms is a true family operation with the owners Chalmers and Lori Anne Carr overseeing every aspect of the business. Family members, along with long-term employees, create a genuine family atmosphere at the farm. Therefore, the pride and ownership of each Titan team member can be seen in their work everyday and is reflected in the quality of the peaches we produce.